ADI's vibratory feeder stands, of rigid, heavy welded steel, provide maximum stability for supporting vibratory feeders. They permit positive vibratory feeder placement and assure the full application of the vibratory base unit vibration to the bowl. 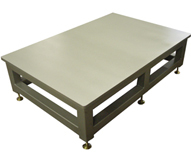 The standard base is equipped with jack screws for convenient leveling. The top plate is supplied with three adjustable foot locators for positioning of the feeder base unit and bowl discharge. If desired, ADI can supply stands without the reinforced base for welding directly onto a machine base. 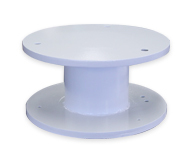 Stand heights are sized to customer requirements. Special stands are supplied on request. 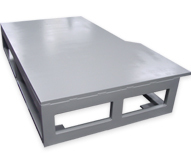 ADI custom designs vibratory feeder stands and support systems which can be built to support single components or be suited to a complete parts feeding system. Customers can specify fabrication materials or have ADI provide various options. FDA approved and custom coatings and color schemes are also available. ADI will custom design and engineer inline feeder stands with the amount of precision your application demands. Consult the factory for a quote or an alternative professional opinion. This adjustable stand is a common design used to support inline / linear feeders and tracks.